Third album ‘Share the joy’ brings this Brooklyn trio of indie darlings to the Coalition for the first night of a UK tour. ‘Share…’ is a more subtle and melodic step on from the short, sharp 60’s influenced garage rock of their first two – critically acclaimed – records, so it ought to broaden their appeal. Right? Well, not on tonight’s evidence, and the lack of audience (Coalition was barely a third full) suggests they’ve still got a long way to go. Voices cold, the leads Cassie Ramone and ‘Kickball Katy’ Goodman were jarringly off-key for the first few tunes. But, by the time the Shangri-Las style ‘Take it as it comes’ had rolled around, they had warmed up. Fun and sugar-coated, the 60s style indie pop brought to mind old duffle coat bands like Heavenly and Talulah Gosh. The influences seem obvious with the Vivian Girls, but I guess originality is unlikely to be a priority for a group that picked a third-hand band name. And it was impossible to watch tonight without checking off a mental list of 80s indie greats. ‘I heard you say’ and ‘The other girls’ were low calorie versions of Lush. ‘Death’ and ‘Lake House’ conjure Courtney Love and Juliana Hatfield. ‘When I’m gone’ and ‘Survival’ from 2009’s ‘Everything goes wrong’ provided (welcome) straight-ahead Dead Kennedys interludes. What’s the problem then? All this sounds like they tick every box in the ‘howtobeindie’ checklist and they even have the requisite look – indie-girly with a pinch of recklessness. Frocks, fringes and tats about sums it up. There was a bit of fun banter between songs (apparently they’ve named the tour the Twerking tour – look it up), and a crowd walkabout by bassist Goodman livened things up a bit. But looks aren’t enough three albums in and the jangle and harmony of the new material started to get rather samey after a while. It was telling that the strongest moment tonight ‘Before I start to cry’ was from older album – a blissful, distorted, break-up tune that smacked of early My Bloody Valentine. But who needs another version of early MBV? 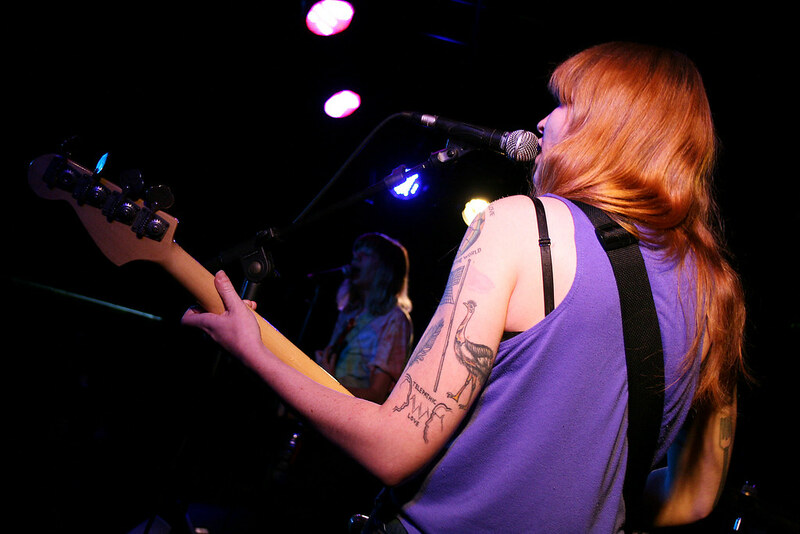 Time will tell whether the Vivian Girls can take their Frock ‘n’ Roll in a more memorable direction in future.